and evaluates a broad variety of gemstones, including: alexandrite, amber, amethyst, aquamarine, citrine, emerald, garnet, jadeite, kunzite, opal, peridot, ruby, sapphire, spinel, tanzanite, topaz, tourmaline, and turquoise. can also indicate country of origin. 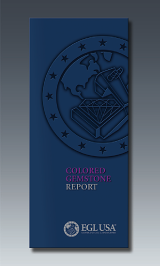 Colored Gemstone Reports are offered in a variety of styles, and are also available for colored gemstone jewelry.